Do you remember when you were at school and teacher said before going on holidays gave you homework to do during the summer? Well yesterday for a freelance sailing photographer like me, it was the same: go to the event, do exercise, take a day off before make this report and edit pictures. If you live near some of the most iconic lakes in the world (Bergamo is very lucky to be in the middle of Lago Maggiore and Lago Lario, aka Como, at the west, and Lago d’Iseo and Lago di Garda eastbound) and you sail (and shoot) on both Palestre della Vela (Lago di Lecco and Lago di Garda) you cannot miss to shoot international Championships! 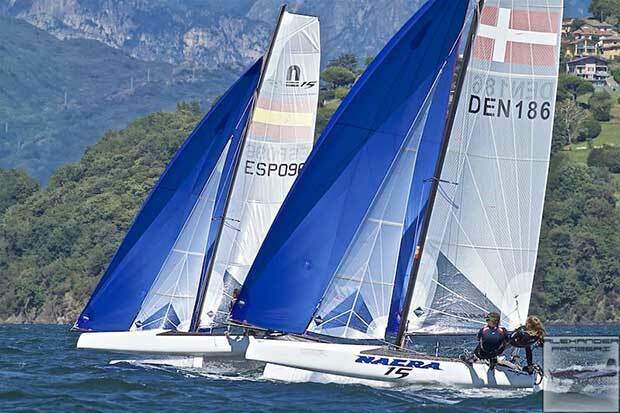 Last week I was at the pearl called Riva del Garda for the Melges 24 class, this week I visited my friends in Gravedona for the Nacra European classes. The interesting thing is that both towns have a similar latitude and they are on top of theirs lakes and they have a considerable history – no spoilers here, you have to visit them! The crew of the club found me a place on a service RIB from where I could shoot photos. The Championship unluckily started the week without wind, but yesterday the lake hshowed the best conditions for sailing (considering that the middle of August is not the best and clusters of storms from the last two weeks have made it difficult to forecast. Sunny spells, 26-28 degreesC temperature, wind starting at 10 finished with 15 knots and gust up to 20, classic short waves. Sailing paradise! A lot of boats and crews are on the ground with relatives too, we are in Italy so why not do your holidays there? There are teams from all over the world; Singapore, Australia, USA, Japan, Argentina, so another big success for the A.V.A.L.- C.D.V. 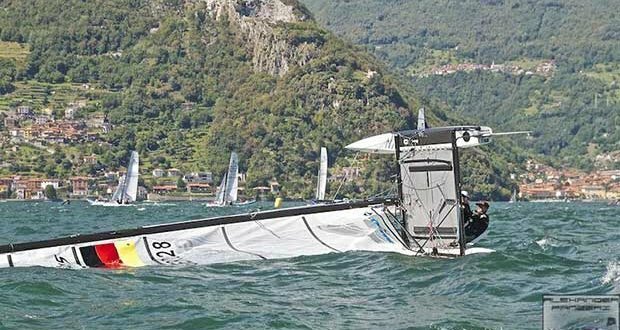 With on starting lines, two parallel fleets and two different finish lines set up, the lake was covered everywhere with these fast multihulls making support to capsized or man overboard sometimes delicate. After the wind start to blow up, the particular short waves of the lake made the race course very technical for the crews (and annoying us on RIBs).